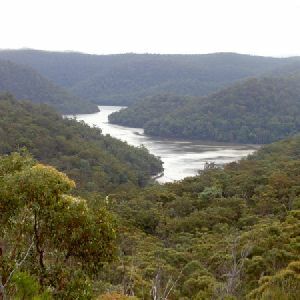 Rumbalara Reserve lies just to the east of the Gosford CBD and is part of Gosford’s Coastal Open Space System (COSS). There is an extensive set of well marked walking tracks within the reserve. 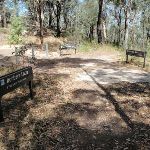 Yaruga Picnic Area has free electric BBQs while both Yaruga and Nurrunga picnic areas have toilets, picnic tables, nearby lookouts and proximity to walking tracks. The picnic areas are accessed via Dolly Ave, Springfield, with the gate being locked at 8pm each evening. 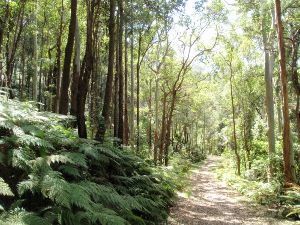 The Rumbalara Environmental Education Centre, at the end of Donnison St, Gosford, is one of several good access points to the walking tracks in the lower section of the reserve. More info. 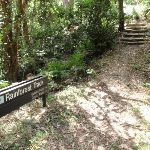 From the trackhead at the intersection of Frederick St and Henry Parry Dr, Gosford, this walk follows the ‘Cappers Gully’ arrow (Rainforest Track sign) along the bush track, away from the road. After a short distance, the walk bends to the left, at a track arrow marker post, crosses a small gully and arrives at an intersection with a management trail near a gate and car park, to the left. Turn right: From the intersection, this walk follows the management trail away from the gate and car park, keeping the small gully to the right. 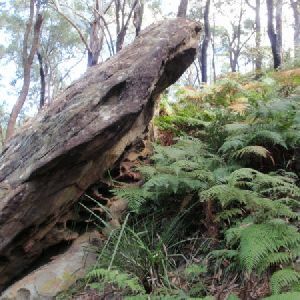 After a short distance, the trail passes a plaque marking the handing over of Cappers Gully Reserve, set in a stone, to the right. The trail continues a little further, bending to the left and arriving at the bottom of a metal staircase. 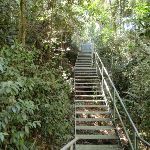 Continue straight: From the end of the management trail, this walk goes up the metal staircase, arriving at an intersection, with a ‘Rainforest Track’ signpost, at the top of the stairs, pointing back to ‘Henry Parry Drive’. The reserve is home to a wide range of flora and fauna. 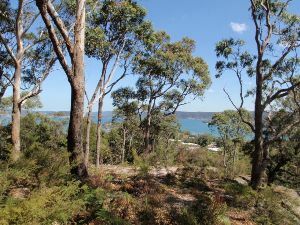 The vegetation types range from the relatively dry ‘Coastal Narrabeen Ironbark Forest’ to pockets of ‘Coastal Warm Temperate Rainforest’. Commonly seen birds include Kookaburras, Eastern Rosellas and Magpies. Rarer birds such as the Glossy Black Cockatoo and Swift Parrot are sometimes sighted here as well. Sugar Gliders, Brush-tailed possums, Blue-tounged lizards and Tree snakes can be seen in the reserve if you are patient and lucky enough. Turn right: From the intersection, the walk follows the bush track in the opposite direction to the ‘Henry Parry Drive’ arrow, leaving the metal staircase behind on the right. The track meanders through some beautiful forest, filled with vines and ferns, crossing a small metal bridge and continuing further, passing a couple of old picnic tables, to the right, and arriving at an intersection beside a fenced-off area, with a ‘Rainforest Track’ signpost pointing back to ‘Henry Parry Drive’. 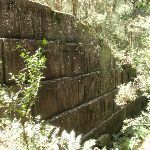 This old quarry site is beside Cappers Gully in the Rumbalara Reserve, Gosford. The area is fenced off for safety reasons. 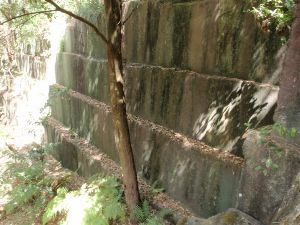 The neat, square-cut walls of the quarry make an interesting sight on the walks in the area. Turn right: From the intersection, this walk follows the management trail in the opposite direction to the ‘Interpretive Centre’ arrow, keeping the fenced area to the right. After a very short distance, the walk arrives at an intersection, signposted ‘Cappers Gully’. Veer left: From the intersection, this walk follows the ‘Ouraka Point’ arrow up the steps and along the bush track. The walk crosses some short metal footbridges and then climbs more steeply, through beautiful forest scenery. 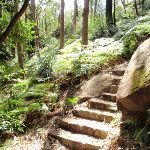 The walk climbs a lot of sandstone steps and some sets of metal stairs, and after some time arrives at an intersection, with a ‘Rainforest Track’ signpost pointing back to ‘Cappers Gully’. Turn left : From the intersection, this walk follows the management trail in the opposite direction to the ‘Bay View Ave’ arrow, leaving the steps of the ‘Rainforest Track’ behind to the left. 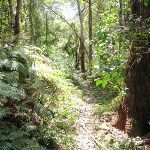 After a short distance, the walk arrives at an intersection, with a bush track to the left, signposted ‘Rainforest Track’. 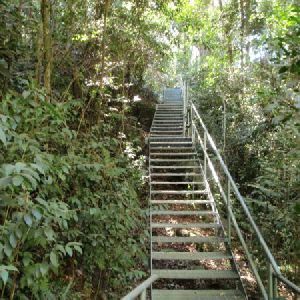 Turn left: From the intersection, this walk follows the ‘Ouraka Point’ arrow down the steps and along the bush track. After descending for a short distance, the track bends to the right and levels out. 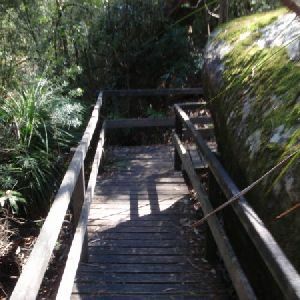 The track meanders for some time through beautiful forest scenery, crossing two short metal footbridges, before climbing a long set of sandstone steps, then a metal staircase, arriving at an intersection with a management trail, with a ‘Rainforest Track’ signpost pointing back to ‘Cappers Gully’. 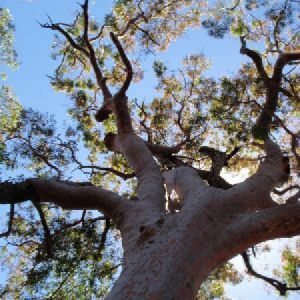 Commonly known as the she-oak, sheoak, ironwood, or beefwood, casuarinas have ‘delicate, slender ultimate branches and leaves that are no more than scales, making the tree look more like a wispy conifer’. 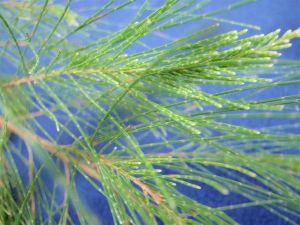 There are 17 species of Casuarina ‘native to Australasia, southeastern Asia, and islands of the western Pacific Ocean’. More info. 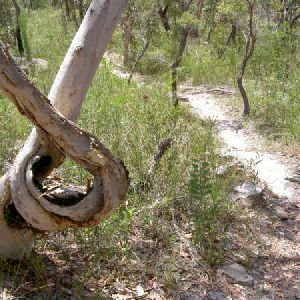 Turn left: From the intersection, this walk follows the ‘Ouraka Point’ arrow along the management trail, going gently up the hill. 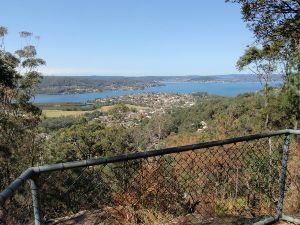 After a short distance, the walk passes an informal, unfenced lookout area with obscured but nice views over Gosford, to the right. 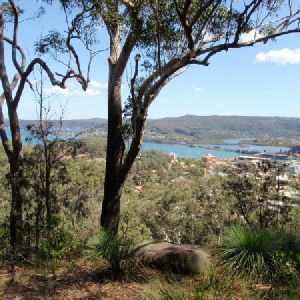 The walk continues a little further, passing a boulder in the middle of the trail, and arriving at the signposted ‘Ouraka Point’, with beautiful views over Gosford and the surrounding areas and waterways. At the end of this side trip, retrace your steps back to the main walk then Continue straight. 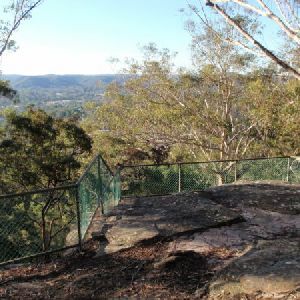 This picturesque spot with fantastic views over Gosford and the surrounding areas, including Brisbane Waters, is located within the Rumbalara Reserve, along the Casuarina Walk. It is a beautiful spot to sit and enjoy the views for a while during a walk in the reserve. 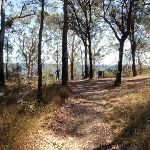 Turn right: From the intersection, this walk follows the ‘Picnic Areas’ arrow along the management trail, keeping the views of Gosford to the left. After a short distance, the walk arrives at a sculpture of Charles Sturt, to the right. 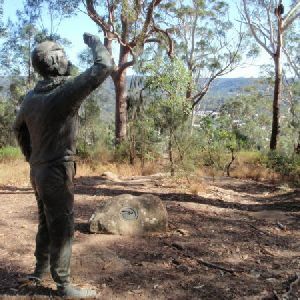 Continue straight: From the sculpture, this walk follows the management trail, keeping the views of Gosford to the left, and leaving Charles Sturt behind on the right. The walk continues along the trail to an intersection with a paved track, signposted ‘Casuarina Track’. 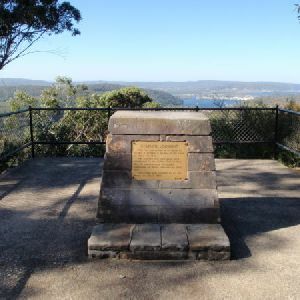 Veer left: From the intersection, this walk follows the ‘Nurrunga Picnic Area’ arrow along the paved track, keeping the views of Gosford to the left. 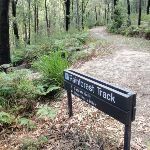 The walk climbs gently for a short distance before arriving at a track junction with signposts for the ‘Ironbark Loop’, the ‘Casuarina Track’ and the ‘Flannel Flower Track’. 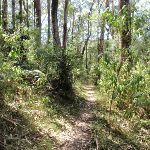 Turn left: From the track junction, this walk follows the ‘Loop to Gosford’ arrow (Casuarina Track) along the bush track, directly away from the nearby car park. After a short distance, the walk arrives at an intersection signposted for the ‘Casuarina Track’ and the ‘Ironbark Loop’. At the time of writing, this part of the Casuarina Track, going down the hill, was closed. 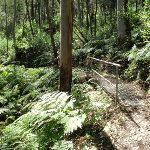 Continue straight: From the intersection, this walk follows the ‘Nurrunga Picnic Area’ arrow (Ironbark Loop sign), along the bush track, keeping the views of Gosford to the left. 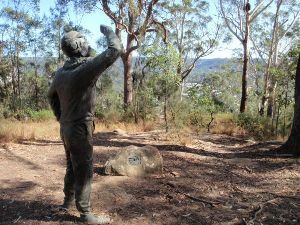 After a short distance, the walk arrives at an intersection, with an ‘Ironbark Loop’ signpost pointing back ‘To Casuarina Track’, beside a sculpture of Matthew Flinders. There are four bronze figurative sculptures in the Rumbalara Reserve that were ‘commissioned in the series “Salute to Famous Australians”, which includes Captain Charles Sturt, Edward Eyre, and Sir Charles Kingsford Smith.’ Matthew Flinders is the fourth in the series. They were ‘commissioned by Sara Lee Kitchens (Australia) Pty Ltd and Gosford City Council for the State Bicentennial Celebrations 1987.’. Smith and Flinders are the most easily reached, at the Nurrunga picnic area. More info. 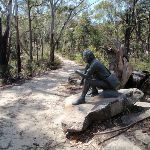 Continue straight: From the intersection, this walk follows the bush track in the opposite direction to the ‘To Casuarina Track’ arrow, leaving the sculpture behind on the right. 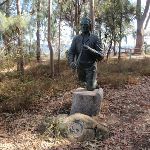 The walk then goes across the end of the picnic area to the sculpture of Sir Charles Kingsford Smith. Turn right: From the sculpture, this walk goes across the middle of the picnic area. 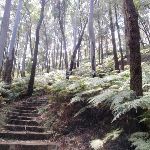 After a short distance, the walk goes up a rocky track and some steps, passing a ‘Nurrunga Picnic Area’ signpost, to the left, arriving at the end of Dolly Ave.
820m of this walk has gentle hills with occasional steps and another 640m is very steep. Whilst another 600m has short steep hills and the remaining 120m is flat with no steps. 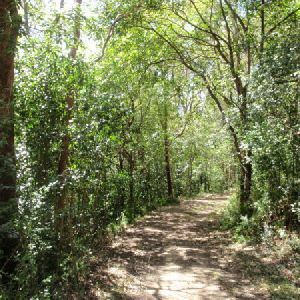 Around 1.5km of this walk follows a formed track, with some branches and other obstacles, whilst the remaining 660m follows a clear and well formed track or trail. Around 2km of this walk has directional signs at most intersection, whilst the remaining 160m is clearly signposted. 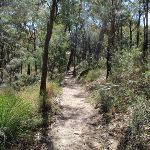 Around 1.4km of this walk requires no previous bushwalking experience, whilst the remaining 820m requires some bushwalking experience. Around 2km of this walk is not usually affected by severe weather events (that would unexpectedly impact safety and navigation), whilst the remaining 160m is affected by storms that may impact your navigation and safety. Around 1.2km of this walk is close to useful facilities (such as fenced cliffs and seats), whilst the remaining 1km has limited facilities (such as not all cliffs fenced). 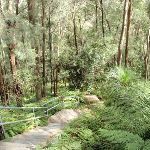 A list of walks that share part of the track with the Rainforest walk to Nurrunga picnic area walk. 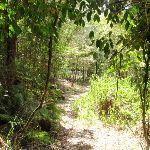 A short, interesting walk in the Rumbalara Reserve, near Gosford. This short circuit walk takes in some nice scenery and a couple of the interesting bronze sculptures found in the reserve. 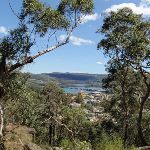 Some short deviations from the walk take you to viewpoints with great views over Gosford and the surrounding areas. Note that the entrance gate on Dolly Ave, for the upper section of Rumbalara, is locked at 8pm each evening. A beautiful walk, taking in some of the scenic highlights of the lower section of the Rumbalara Reserve. 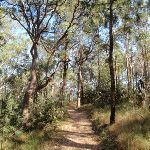 The walk covers a great variety of vegetation, from quite dry eucalypt forest through to rainforest. The tracks are well formed, with a lot of steps in the steeper sections, making the walking a little easier. 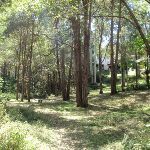 This is a great walk to see some of the excellent scenery in Rumbalara. 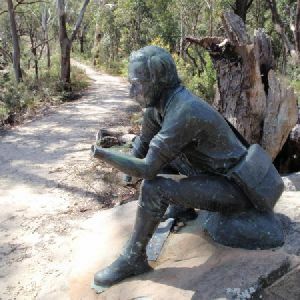 A very short, optional sidetrip takes you to a sculpture of Charles Sturt, adding some more variety to the walk. 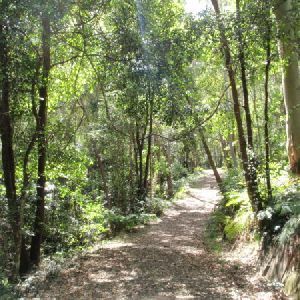 The easy access from Gosford train station also makes it a great walk for those using public transport. Pretty well the grand tour of the Rumbalara Reserve, this walk takes in much of the great scenery the reserve has to offer. The walk covers both the lower and upper sections of the reserve and passes through the great variety of forest on show. The walk also passes three of the four bronze sculptures in the reserve. Yaruga picnic area would be a great spot to stop for lunch with it’s facilities and excellent views. 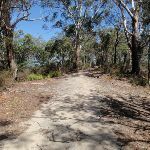 This walk starts at the bottom of Katandra Reserve and heads up the hill, exploring the ridge on the way to Gosford Station. You will visit a wide variety of plant communities and some lovely vistas over the surrounding towns and water. Along some of the secluded sections, you may forget that you are so close to houses. You will also find a few picnic areas and lookouts along the way, providing great places to rest. 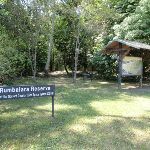 A list of walks that start near the Rainforest walk to Nurrunga picnic area walk. 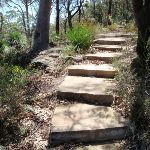 A steep walk from North Gosford to the top of the Rumbalara Reserve. 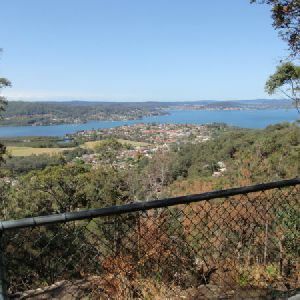 There is some great scenery along the way, and the views from the Wannagan Lookout, back over North Gosford and the surrounding area, are great. An optional sidetrip to the bronze sculpture of Edward John Eyre adds some historic interest to the walk. 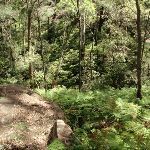 This overnight walk explores the main ridge of Brisbane Water National Park. Starting at Girrakool picnic area in the north, this track heads over Scopas Peak, with some excellent views over Mooney Mooney creek, and then over Mt Wondabyne, further south. 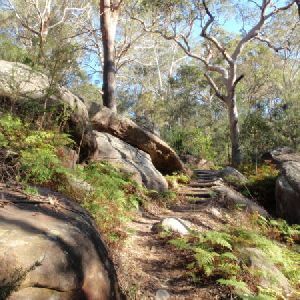 Much of this walk follows the Great North Walk, and it uses a campsite at the base of Mt Wondabyne. There are bus and ferry services from Patonga. 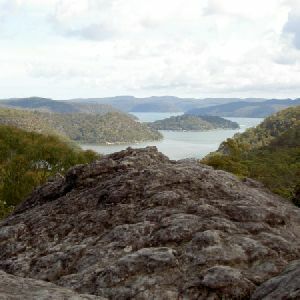 This walk starts from the Girrakool picnic area and winds south, through the Brisbane Waters National Park. The walk crosses some long rock flats and climbs to the top of Scopas Peak, providing views spanning right across the park. 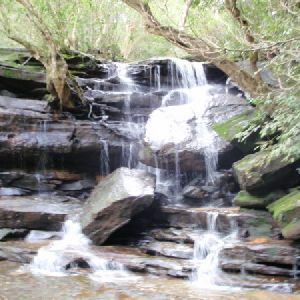 The walk then continues down to Wondabyne station, and provides an optional side trip to the Kariong Brook falls. 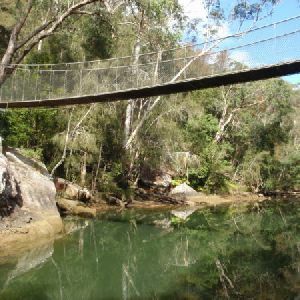 Starting from the Girrakool picnic area, this walk takes you on a round trip through part of the stunning Brisbane Water National Park. 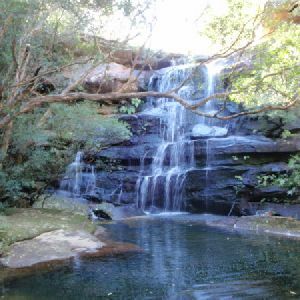 The walk explores both sides of Piles Creek, rewarding you with its waterfall and lookouts. Girrakool picnic area also has barbeques and toilets. This walk explores the western half of the Girrakool Loop track. 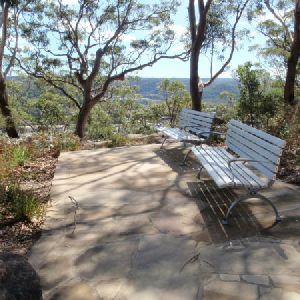 From the picnic area, this walk heads down the footpath to Illoura Lookout, with views down over Piles Creek (there is an optional side trip to the top of the waterfall). 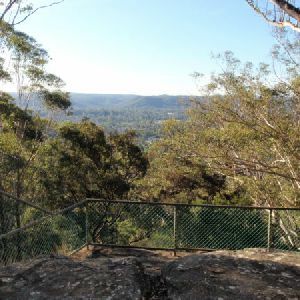 The walk then has another optional trip to Bundilla Lookout, providing a distant but square view of Piles Creek falls. The walk continues around the loop, enjoying the wildflowers which are in bloom late winter and spring. Before looping back to the picnic area, there are two more lookouts with filtered views. 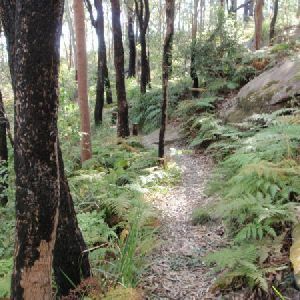 http://new.wildwalks.com/wildwalks_custom/includes/walk_fire_danger.php?walkid=nsw-rumbalarares-rwtnpa Each park may have its own fire ban, this rating is only valid for today and is based on information from the RFS Please check the RFS Website for more information.